I’ve talked a lot about our Food Rules here at the Arbolodge but a lot of those rules are in situations I have full control on such as our dinner table. So what about eating at school? With school coming up fast and furious in a few short weeks, I thought I’d post some thoughts about school lunches. In our school district, kids get between 15-20 minutes to wash their hands, get their lunch kits, and eat. The difference in time is based on what school they attend as it is set by the administrator. I will say that for both kindergarten and grade one, Kale has had teachers who understand the importance of food, get it that some kids eat a bit slower, and have had no problem with an extra snack in the middle of the afternoon, starting a bit earlier than the rest of the class, or taking his lunch with him outside to play. I’m hoping he has the same teacher again (he’s in a split 1/2 class) with the same laid back food attitude. Hungry children simply can’t learn – and frankly I’d rather remove 5 minutes from playground time where Kale’s primary activities are playing some game called “Fire” where they move to various “safe spots” to avoid the fire, wheeling and dealing Pokemon, and as is often the case, finishing the lunch he couldn’t finish in his lunch eating time. I can easily add physical activity at home after school (here, dust this thing! Go make a Hot Wheels ramp! Go check the chickens for eggs!) but I can’t retro- or pro- actively put food in his face. Food, like sleep, has to come at regular intervals. Kale used to bring a Goodbyn as his lunch box but in early grade one, lunches started coming home almost completely untouched. We talked about it, and he told me that it was hard to open the Goodbyn on his own (which may have been due in part to the time Mooki decided to try and open it with her teeth and left her mark) and some of the partitions were “too deep” so we switched to a wholly unremarkable square Rubbermaid Flex & Seal Food storage container. The exact model is now discontinued and has been replaced with a similar one (below) but there is really nothing remarkable about it. Suddenly, lunches were being finished again. Choose a box, bin, or bag that your child can easily get into, is washable, and that will prevent the food from being crushed. Do not choose it because it has a special character on it, or because it matches the backpack or because it is cute. Also, have an idea of what your child will eat in an average lunch and make sure that amount would fit in the container you’ve chosen. Our school (and most from what I can tell) will ask you to pack the recess snack separate from the lunch for quick access, so consider that as well. So what do I put in Kale’s lunches? I try to cover all the bases, a protein (sometimes tofu, sometimes meat, sometimes leftover dinner), a dairy, two veggies, a fruit – sometimes two, a grain, sometimes a treat. Kale is not a huge fan of sandwiches – they take him way too long to eat – so we tend not to have those for school lunches. I also cut up and pre-portion things like the veggies and fruit. Whatever it takes to ensure he has no reason not to eat it. Kids get bored of eating apples – you have to hold it the whole time, it can be a bit messy or juicy on your hand, and there is a part in the middle you don’t eat. Offering pre-cut apple slices can make all the difference. For snack pretty much every single day he has a yogurt tube and a granola bar. I HATE commercial yogurt tubes but after trying homemade ones for a few months, I agreed with Kale that they were a bit messy and often leaked. I’d rather food went into Kale than spoiled in his pack, even if it’s food with some ingredients I am not really in love with. Cucumber, strawberries, grapes, salami, yogurt tube, granola bar, snap pea crisps, babybel, seaweed snack (not pictured), and a tiny little organic hard candy. There’s variety here, in the veggies and fruit choices, but I also try hard to make it really predictable for him. For all four of these sample lunches, he ate everything that day, but if he isn’t super hungry that day, he would skip the Babybel and /or the Snap Pea Crisps. He’s also recently informed me that Babybels aren’t his thing anymore – so we’ve moved on to another kind of pre-portioned cheese. Lunches probably cost around $3 per day, perhaps a bit more in the winter when fresh fruit is a bit higher priced. We buy a lot of veggies and fruit on sale, and what goes in his lunch is based on that. The premade items, like the Snap Pea Crisps, Yogurt Tubes, and pre-portioned cheeses are likely where I could cut costs a bit more – I could send cheese slices or insist on the homemade yogurt tubes every day. In place of the snap pea crisps, he was taking crackers to school each day, and if he decides he’s done with the snap pea crisps at some point, we’ll go back to those. 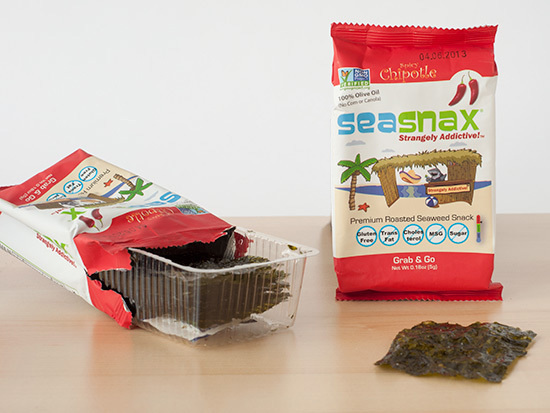 The seaweed snack is a real value item if your child will eat it. Kale thinks these are yummy. Seaweed is pretty healthy for kids – it’s packed with minerals and is low in cholesterol and fat. I like that there is no colouring in the seaweed (at least, as far as I can tell from the ingredients). The ones I’m buying these days are from the Asian section at Superstore for about $8 for a huge package if I recall correctly. It has sheets of perforated individual portions, and there are 100 in the package. Each little portion has about 6 sheets of 3″ X 1.5″ seaweed. I’ve seen the roasted and flavoured ones in the huge package but the serving is a bit big and the over packaging is pretty crazy. Above all, you have to listen to what your child is saying, and sometimes listen between the lines. Last winter, Kale asked to not have oranges anymore, and at first I thought it was because he was sick of them – we’d been eating some particularly delectable mandarin oranges for a few weeks. But then he’d scarf back two of them after school, and I realized it was because at home I always “start” his orange! All I had to do what make a small flap in the orange peel and pack it up. Same went for bananas – he could eat a case of them at home but doesn’t want them at school because they’re too hard to open on his own and they bruise too easy. Bring your child shopping with you to select fruits, vegetables, and other parts of their lunch. Kale sometimes gets lunch meat in his lunch, so he also gets to pick it. I also regularly ask for his feedback. Was it too much food, not enough food, not tasty enough, took too long to eat? I sometimes try something a bit different – like the leftover tuna noodle salad – and discover it’s something he wants in his lunch regularly. Experiment at home with food portioned the way it would be in their lunch box to see if your child can manage the serving/container/utensil required to eat them. I’ve heard stories of soup being sent to school and the kid not being able to open the thermos and being too embarrassed to ask for help to open it and so they’ve left hungry. Will three leftover cold perogies really fill them up? Or can they eat 6? You have two lunch times on the weekend – they’re good testing grounds. Talk with other parents, and offer to swap some snacks for experimentation’s sake. Nothing worse than going to Costco, buying a giant box of some packaged snack, and then discovering your kid hates it. If you don’t know if your child will eat seaweed snacks, buy some of the ones available individually or ask to swap with another parent until you know for sure and can shop for a bulk buy. Trust me, you are not the only parent struggling with your kids’ lunch, I promise. Role model good lunches. I struggle with this one a little bit, but when you pack your child a lovely fruit and veggie filled lunch full of crunchy, colourful tasty things, make one for you, too. Your child seeing you eat a boxed/bagged lunch with similar foods might just convince them to eat whether they know it or not just because it’s what his or her parents do. Above all, try not to stress too much about food at school. You can only do what you can do, and if lunch at school is a mess, focus on high quality, tasty, and nutritious foods at home. If your kid is happy with a ham sandwich and an apple – send that! But if your kid needs a bit more effort when it comes to lunches and school snacks, remember you’re the parent – you can solve this one, too. Oh Dear I guess I blew that one. I don’t remember putting that much effort into lunches. Sorry about that. ha ha. They look very yummy.